Petrol prices were hiked in all four metro cities for the sixth straight day on Tuesday, according to the website of Indian Oil Corporation (IOC) Limited. Diesel prices also followed suite and were raised in all four metros for the sixth day in a row, IOC website stated. One litre of petrol was being sold at the rate of Rs. 76.53 in New Delhi, Rs. 83.91 in Mumbai, Rs. 79.20 in Kolkata and Rs. 79.43 in Chennai. One litre of diesel was being sold at Rs. 68.23 in New Delhi, Rs. 72.40 in Mumbai, Rs. 70.78 in Kolkata and Rs. 72.03 in Chennai. Petrol prices were increased by 0.17 paise in New Delhi, 0.16 paise in Mumbai, 0.17 paise in Kolkata, and 0.18 paise in Chennai. 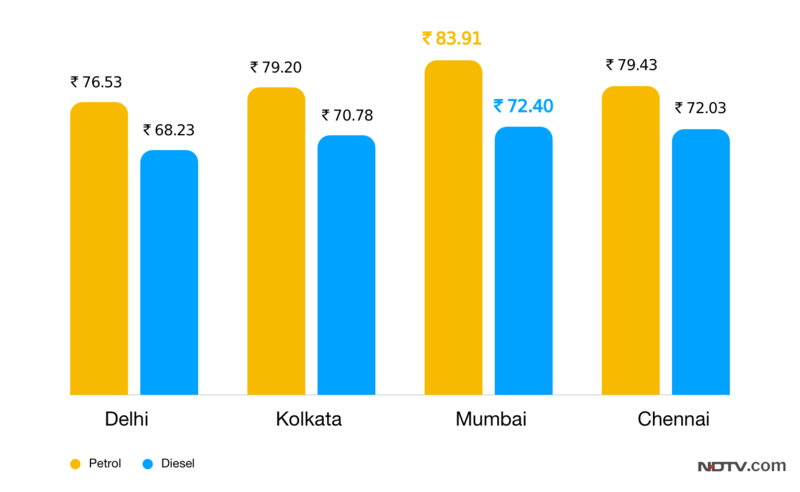 Diesel prices were raised by 0.16 paise in New Delhi, 0.17 paise in Mumbai, 0.16 paise in Kolkata, and 0.18 paise in Chennai. On Monday, one litre of petrol was priced at Rs. 76.36 in New Delhi, Rs. 83.75 in Mumbai, Rs. 79.03 in Kolkata and Rs. 79.25 in Chennai. Diesel prices were at Rs. 68.07 in New Delhi, Rs. 72.23 in Mumbai, Rs. 70.62 in Kolkata, and Rs. 71.85 in Chennai, on Monday. Globally, oil prices rose on escalating concerns about potential supply shortages, with Brent crude leading the way as hundreds of oil workers in Norway are set to go on strike later in the day after failed wage talks. Brent crude had added 25 cents, or 0.3 per cent, to $78.32 per barrel by 0056 GMT, following a 1.2-per cent climb on Monday, according to a report by news agency Reuters. US light crude futures were up by 17 cents, or 0.2 per cent, at $74.02. They gained 5 cents to settle at $73.85 a barrel the session before. Hundreds of workers on Norwegian oil and gas offshore rigs are due to go on strike on Tuesday after rejecting a proposed wage deal, a move which will likely affect the production of at least one field, Shell’s Knarr.